Bare Pool is located at the Mirage, with the trek to get there winding through a jungle oasis that feels like a secret hideaway. Upon arrival, you’ll find an intimate pool area surrounded by palm trees and lush greenery. Bare offers a more relaxing, chill atmosphere without the wall-to-wall packed in feeling of some of the other clubs. You’ll find 14,000 square feet that includes two luxury dipping pools, a full service bar, six plasma screens, poolside daybeds, chaise lounge chairs and cabanas. 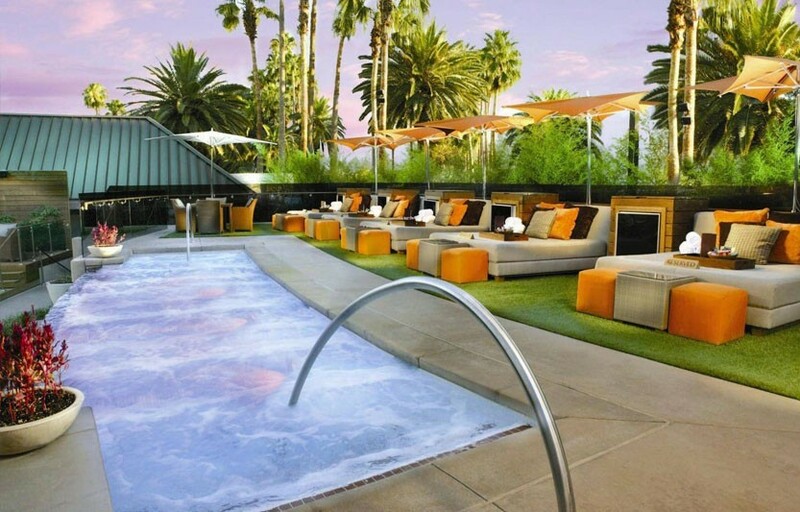 Bare is a smaller pool with more of a chill lounge vibe rather than a dayclub type vibe. Where is Bare Pool & Lounge located? 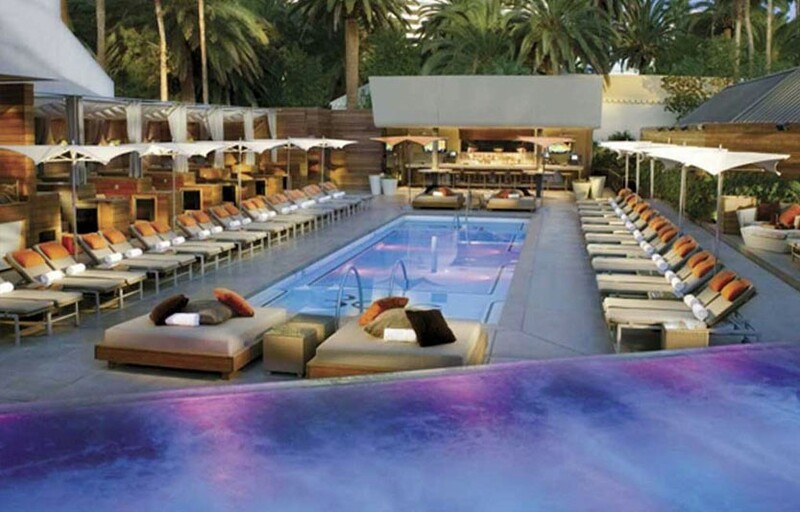 Bare Pool & Lounge is located at the Mirage on the north end of the strip, across the Palazzo. How much is cover charge at the door for Bare? Women are always $10, while men pay $20 Sunday through Thursday and $40 on Friday and Saturday. How long will I have to wait at Bare Pool & Lounge? You usually won’t need to wait to get into Bare unless it’s a holiday weekend or special event. When is Bare Pool & Lounge open? The pools are open daily from 10:30 to sundown. 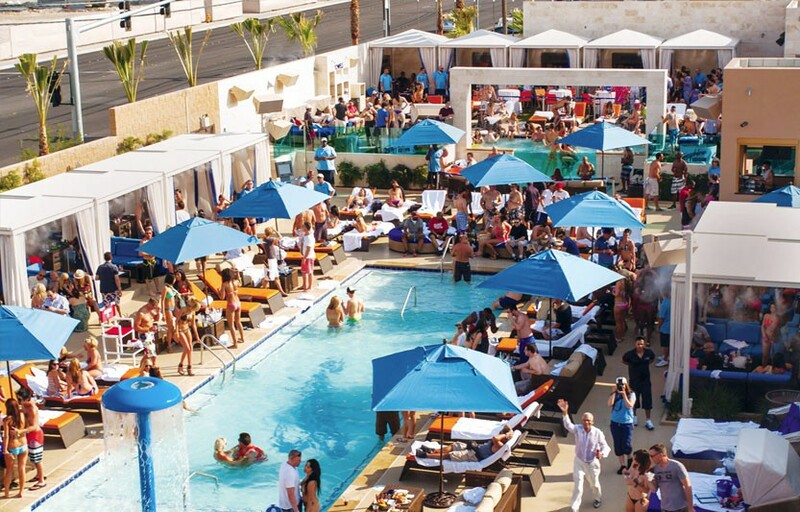 On Fridays, Saturdays, and Sundays you’ll have a more rowdy, “dayclub” like atmosphere. The rest of the time expect to find most people lounging and sunbathing. What are the best days to go to Bare Pool & Lounge? Depends what you’re looking for. Sunday Brunch is a great way to top off a weekend of debauchery. What is the dress code at Bare Pool & Lounge? Pool/beach attire. Swimwear is highly encouraged. How much do drinks cost at Bare Pool & Lounge? Mixed drinks / cocktails Start at $16, Beers $8, Shots $10, and Bottles start at $425. Bare usually features local talent with live performances on occasion. What kind of music do they play at Bare? Bare plays a mix of hip hop, EDM, and top 40. Where can I find an list of upcoming events / DJs at Bare Pool & Lounge? You can download the Discotech app to see upcoming events, get on guestlists, book tables, and buy tickets for Bare. You can also visit Bare’s website for a current list of events. When does Bare Pool open for the summer? When does Bare Pool close for the summer? Bare Pool’s season usually starts sometime in March and ends in November. Exact dates vary year to year, depending on weather. We’ll post events on the app as soon as they are available – check our app for updates! In which hotel is Bare located? Bare is located in the Mirage. Looking for VIP offers and comps at the Mirage? Check out URComped.com to find a Casino Host at Mirage.